Worth The Read: Mendelsohn's "The Lessons of Lindsay"
Supremely regarded photojournalist Matt Mendelsohn makes the push to get a story he's passionate about out, and it's well worth a read. The back story on this, is that it was scheduled to run in a national newspaper magazine, but did not because the paper was afraid it would scare advertisers away. During a time when there is so much discussion about Self Magazine (more here) photoshopping Kelly Clarkson thirty-pounds lighter, justified as (so what if we made her thin on the cover? ; we're just trying to help Kelly Clarkson "be her best") this is a great rebuttal. These old pillars of publishing, which are now evidencing why they are losing readership, have been trumped by the online community (once again) with a thoughtful and well written piece by Matt - The Lessons of Lindsay. It's too late for major traditional news media outlets to "get it", but for those committed to telling the story, there is a huge potential readership to be had, and this piece should go viral for so many reasons. Emerging trends in successful photographer websites. Build a website that photo buyers will love. PhotoShelter surveyed 550+ commercial and editorial photo buyers to get the scoop on what can make or break your photography website. Use the results to help you sell more photography. PhotoShelter co-founder Grover Sanschagrin will review the survey findings and discuss the designs and features that photobuyers care about most. Don't buy or design a website without this info! So, if you want insights/guidance on how to do it, or get it done right, don't miss their presentation! Register here for free now. with client budgets tight these days what can you do to convince them that you are worth it? Lowering your prices is an Ill-advised plan because those clients will expect the lower rates when things get better. Instead promote the VALUE you will bring to the assignment . By emphasizing value with phrases like " our approach to this assignment will bring real value to your customers' perception of your widget..." or "the value we will bring to this assignment will result in images that will make your prospective client more aware of the benefits of your service..."
You can also emphasize the long term benefits of your work. Conveying to a client in your own words concepts like "long after the sweet fragarence of the floral arrangements had faded, photographs that stink will be a reminder of where costs should not be cut" or "four color press releases won't make up to photographs that miss the moment..."
Let me stress- these are phrases that illustrate concepts and using that language might come across with the unspoken perception of you being " how dare he tell me how to spend my money..."
In the end, you need to convey to your prospective client that you are the best choice for the assignment and right now in a cost-conscious economy, emphasizing your services as valuable will help them make the right choice-you. To be blunt - NORML's use of the Lisa Jack image of Barack Obama is, in this author's opinion, plain and simple, copyright infringement. 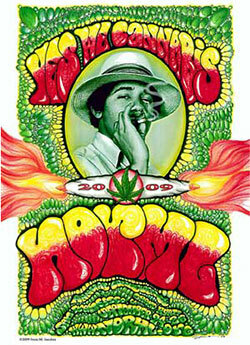 Photo District News did two great pieces on this - From Hope to Dope: Another Obama Poster Dispute and Getty: We'll Fight NORML's Copyright Infringement, so I won't re-hash what they wrote here. What I will say about the image at right, is that the poster is an illustration SURROUNDING a photographic image. Unlike Shepard Fairey's claim of fair-use and derivative use, where (Fairey claims) the resulting image was so significantly different that other than angle of view expression/subject, the resulting work was not substantial enough that the original photographer has a claim (this is the inaccurate position of Shepard Fairey), this use has a hole in the center they filled with a photograph. Other than applying a green duotone tint to the original black and white, it's a photograph. They added in a swirl of smoke, but it's a photo, plain and simple. Since Getty is quoted in the PDN piece as saying "will aggressively pursue this matter as the copyright representative of the artist" the question at hand will be the soundness of Getty's copyright registration. If they simply included the Jack images in their own registration process, as a part of a "database addition" registration (which some agencies have done in the past), where they register multiple photographers' work in a single registration, that will be a big problem. If, however, Jack had registered the work herself, Getty will have substantial ground to stand on. The strength of this case will test Getty's (and other agencies) copyright registration procedures, if it goes to court, which is looks like it might. If Getty does go to court, and loses over a questionable registration, it could well signal open season on infringements on Getty and other agencies. Look to Getty to try very hard to settle this case quietly.